At the time of Spanish contact in the sixteenth century, the Aztec were the preeminent power in Mexico, and to the east controlled lands bordering the Maya region. Whereas the Maya were neither culturally nor politically unified as a single entity in the sixteenth century, the Aztec were an empire integrated by the state language of Nahuatl as well as a complex religious system. As the principal political force during the Spanish conquest, the Aztec were extensively studied at this time. Due to sixteenth-century manuscripts written both by the Aztec and Spanish clerics, a great deal is known of Aztec religious beliefs and ritual, including death rituals. Probably the most discussed and vilified aspect of Aztec religion is human sacrifice, which is amply documented by archaeological excavations, pre-Hispanic art, and colonial accounts. To the Aztec, cosmic balance and therefore life would not be possible without offering sacrificial blood to forces of life and fertility, such as the sun, rain, and the earth. Thus in Aztec myth, the gods sacrificed themselves for the newly created sun to move on its path. The offering of children to the rain gods was considered a repayment for their bestowal of abundant water and crops. Aside from sacrificial offerings, death itself was also a means of feeding and balancing cosmic forces. Many pre-Hispanic scenes illustrate burial as an act of the feeding the earth, with the bundled dead in the open maw of the earth monster. Just as day became night, death was a natural and necessary fate for the living. The sixteenth-century accounts written in Spanish and Nahuatl provide detailed descriptions of Aztec concepts of death and the afterlife. One of the most important accounts of Aztec mortuary rites and beliefs concerning the hereafter occurs in Book 3 of the Florentine Codex, an encyclopedic treatise of Aztec culture compiled by the Franciscan Fray Bernardino de Sahagún. According to this and other early accounts, the treatment of the body and the destiny of the soul in the afterlife depended in large part on one's social role and mode of death, in contrast to Western beliefs that personal behavior in life determines one's afterlife. People who eventually succumbed to illness and old age went to Mictlan, the dark underworld presided by the skeletal god of death, Mictlantecuhtli, and his consort Mictlancihuatl. In preparation for this journey, the corpse was dressed in paper vestments, wrapped and tied in a cloth bundle, and then cremated, along with a dog to serve as a guide through the underworld. The path to Mictlan traversed a landscape fraught with dangers, including fierce beasts, clashing mountains, and obsidian-bladed winds. Having passed these perils, the soul reached gloomy, soot-filled Mictlan, "the place of mystery, the place of the unfleshed, the place where there is arriving, the place with no smoke hole, the place with no fireplace" (Sahagún 1978, Book 3, p. 42). With no exits, Mictlan was a place of no return. Aside from the dreary, hellish realm of Mictlan, there was the afterworld of Tlalocan, the paradise of Tlaloc, the god of rain and water. A region of eternal spring, abundance, and wealth, this place was for those who died by lightning, drowning, or were afflicted by particular diseases, such as pustules or gout. Rather than being cremated, these individuals were buried whole with images of the mountain gods, beings closely related to Tlaloc. Another source compiled by Sahagún, the Primeros Memoriales, contains a fascinating account of a noble woman who, after being accidentally buried alive, journeys to the netherworld paradise of Tlalocan to receive a gift and message from the rain god. A group of men in front of the Basilica of Our Lady of Guadalupe in Mexico perform an Aztec dance during the feast of the Virgin of Guadalupe on December 12, the most important religious holiday in Mexico. 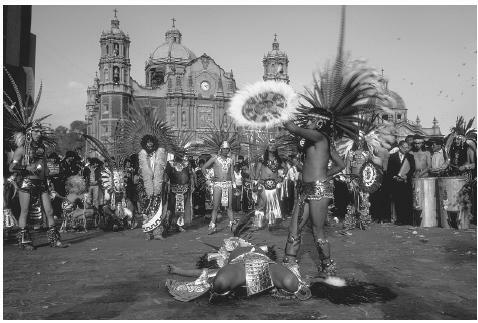 Here they reenact the prepara tion of a sacrifice, a recognition of the inextricable interdependence of life and death to the Aztec. zenith in the sky, where they would then scatter to sip flowers in this celestial paradise. The setting western sun would then be greeted by female warriors, which were the souls of those women who died in childbirth. In Aztec thought, the pregnant woman was like a warrior who symbolically captured her child for the Aztec state in the painful and bloody battle of birth. Considered as female aspects of defeated heroic warriors, women dying in childbirth became fierce goddesses who carried the setting sun into the netherworld realm of Mictlan. In contrast to the afterworld realms of Mictlan and Tlalocan, the paradise of warriors did relate to how one behaved on earth, as this was the region for the valorous who both lived and died as heroes. This ethos of bravery and self-sacrifice was a powerful ideological means to ensure the commitment of warriors to the growth and well-being of the empire. For the Aztec, yearly ceremonies pertaining to the dead were performed during two consecutive twenty-day months, the first month for children, and the second for adults, with special focus on the cult of the warrior souls. Although then occurring in the late summertime of August, many aspects of these ceremonies have continued in the fall Catholic celebrations of All Saints' Day and All Souls' Day. Along with the ritual offering of food for the visiting dead, marigolds frequently play a major part in the contemporary celebrations, a flower specifically related to the dead in Aztec ritual. López Austin, Alfredo. The Human Body and Ideology: Concepts of the Ancient Nahuas. Salt Lake City: University of Utah Press, 1980. Furst, Jill Leslie McKeever. The Natural History of the Soul in Ancient Mexico. New Haven, CT: Yale University Press, 1995. Sahagún, Fray Bernardino de. Primeros Memoriales, translated by Thelma Sullivan. Norman: University of Oklahoma Press, 1997. Sahagún, Fray Bernardino de. Florentine Codex: General History of the Things of New Spain, translated by Arthur J. O. Anderson and Charles E. Dibble. 13 vols. Santa Fe, NM: School of American Research, 1950–1982.